Problem: What’s the best way to solve an inter-carrier usage dispute when 2 carriers, looking at their own call records, arrive at vastly different conclusions as to amount owed? Answer: Combine both record sources together, and match record-for-record to isolate any and all discrepancies. Having recognized a widespread problem in our industry, ATS has developed a tool to help carriers resolve complex inter-carrier disputes with greater speed and accuracy. A typical inter-carrier billing dispute involves two carriers who disagree on the amount of minutes terminating to, or transiting through, each other’s networks. We have found that the fastest way to resolve such disputes is to analyze both companies’ call records for a set period (typically, a day, week or month) and to attempt to match, record-for-record, each call event recorded in two different locations. (For instance: A CLEC’s end-office and an RBOC’s Tandem). 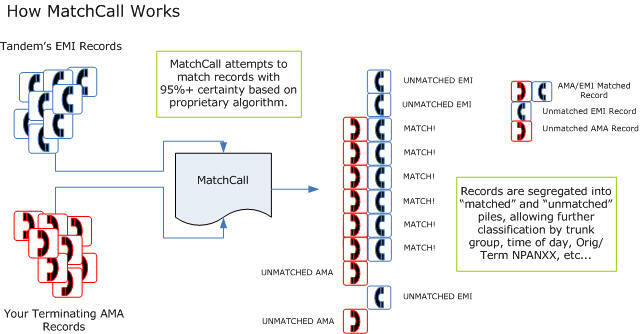 MatchCall performs a record-for-record match for every call based on various criteria at a speed of more than 15 million records per hour. Call records that are found to be unmatched can be further analyzed to determine if they were dropped for a valid reason or if they represent un-billed revenue.